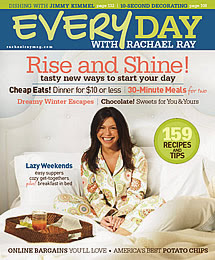 Any article that includes both Gourmet magazine and Every Day with Rachael Ray has to be interesting, right? Myrna Blyth of the New York Sun incorporated both magazines into her piece about how food mags are bucking the trends of the magazine industry. Blyth notes that even though "the circulation and advertising for most magazines are as flat as a collapsed souffle, magazines about food are doing surprisingly well" and "[l]eading the pack is Every Day with Rachael Ray, which recently celebrated its first anniversary." She also reveals that the magazine reached a circulation of nearly 1 million in 12 months. The President of Reader's Digest U.S. Publishing, which publishes Every Day with Rachael Ray, says: "We will be at a circulation of 1.7 million by next August." These increases aren't surprising, since the launch of Every Day with Rachael Ray was the "biggest and most successful launch since O: The Oprah Magazine hit the newsstands in 2000." "Even though we were late to the party, it was inevitable that Americans would discover food," Gourmet's editor in chief, Ruth Reichl, said. "In recent years we have grown more familiar with cultures that celebrate food, like Asian, Mediterranean, and Latino. Our interest in food and our tastes have changed. In the 50s and 60s we were told that cooking was drudgery. But people do like to cook. Cooking is something that makes us human." A more recent article in Media Life Magazine confirmed that the food was fastest-growing category of magazines, giving credit to Martha Stewart's Everyday Food and Rachael Ray's Every Day with Rachael Ray for the trend. This is all good news for me, since I signed up for a two-year subscription!